With the 2009 smash hit Angry Birds, the casual physics-based puzzle genre was born. Since then, a lot of simple, relatively casual puzzle games have shown up on the PC and iOS in an attempt to capture some of that same audience. Rogue Rocket Games’ Gunpowder is one of the latest such releases on Steam. It combines physics and puzzle solving with a little bit of a twist – explosions. In Gunpowder, blowing up powder kegs with the game’s titular substance is the primary game mechanic. It sounds like a fun basis for the game, and it generally is. There are a lot of good puzzles to be had here, although the game isn’t quite as addictive or enduring as you would hope for. It has its flaws, but it is still an enjoyable once through experience. In Gunpowder, you play as the heroic rogue Incendio, who robs from the evil Boss Grimshaw to return the gold that he has confiscated its rightful owners. The game fashions itself as a sort of Robin Hood story, but the story isn’t developed. It isn’t a story so much as a premise, and the characters Incendio and Boss Grimshaw have about as much background as a couple of arcade game characters from the 1980s. But, no matter – after all, you aren’t playing this type of puzzle game for the story, so the simple foundation for why you are blowing up safes and piggy banks is adequate. As mentioned above, your goal is to destroy one safe and three optional piggy banks on each level. To blow them up, you place trails of gunpowder and exploding kegs on the field of play, and then draw the gunpowder to an ignition source and hopefully watch a chain reaction that destroys everything in sight. There are a variety of environmental tools and obstacles that you will have to either exploit or eliminate in the process. There are mine carts that carry flammable coal or dynamite. There are gaps or pools of water that you can’t draw gunpowder through. There are rock walls that you have to destroy before getting at whatever is behind it. There are gigantic boulders that get thrown into the air by an explosion and destroy anything that they land on. There are also cannons and Gatling guns that can help you get the job done by firing projectiles at objects. And, there are lift platforms that you can move up or down by taking away or removing weight. For a game with such a simple premise, Gunpowder cleverly gets a lot out of it. For most of the game’s 125 core levels, your only job is to either draw gunpowder or place kegs. The game does a great job of mixing up its challenges that involve just these two basic mechanics. As you progress through the game, you will continuously encounter new challenges and find new tricks for solving puzzles. For instance, the safe may be located behind a solid rock wall, and you can’t draw gunpowder through that wall. So, you have to set up an explosion to destroy the wall first, and then you have to draw the powder to the safe while your trail of gunpowder is still actively burning. Not only do you have to set up your Rube Goldberg type physics chain, but you frequently have to modify them in the middle of the action. This twist sets up a lot of interesting (and occasionally frustrating) challenges. Like a lot of good puzzles games, items have their main use, and then some sort of auxiliary use that you discover as you encounter tougher puzzles. For instance, kegs are obviously used to destroy stuff, but they can also be used to redirect mine carts when placed on a track. The mine carts can carry flames or explosives, but they can also be used to weight down platforms. This type of clever design allows the game to stay fresh. If you like puzzle solving highs, then you will be pleased to know that Gunpowder has plenty of them. There is a wide range of challenge in the game, ranging from no-brainers that teach you the basics to levels that seem like they are broken because they look impossible at first. You may find yourself saying “if only I had just one more keg” or “if only I had just a little bit more powder”, right before the light bulb goes off above your head. The “aha” moment that comes when you finally figure it out is satisfying. The basic gameplay for Gunpowder is adequate, but for some reason, the act of setting up a chain to see everything explode isn’t as fun as it should be. The culprit here might be the game’s uninspired visuals and lack of interesting environments. Since the game takes place in a Wild West type setting, brown wood and sand dominate the scenery. The most common destructible objects are brown boxes, cacti, and stone walls. In the winter-themed levels, you can blow up snowmen too. There is the rare windmill or oil derrick, and on one level you get to knock over a gigantic statue. For the most part though, that is about it. It is a far cry from a game like Angry Birds Star Wars, where just watching carnage unfold after you launch a bird is half the fun. Gunpowder isn’t strong in the replayability department either, since most levels have just one way to solve them and there isn’t much that happens procedurally. Gunpowder has some other minor issues as well. The game is locked in an overhead isometric perspective, with no ability to zoom in. This is an ability that you will wish the game had many times, especially on the large levels where the view is zoomed way out. Some of the levels have verticality to them that is very difficult to perceive only from overhead. The puzzles can get frustrating at times too, not just because you can’t figure out how to solve them, but because there are many irritating ways in which your sequence can get broken. If there is just a tiny gap in your gunpowder trail that you leave in by accident, then the flame stops travelling and you have to start all over again. Some solutions take a while to set up, so if one tiny little mistake ruins your whole plan, having to set it up all over again can be irritating. Gunpowder, like so many little indie puzzle games, does not benefit from a huge graphics budget. Many of these games are able to hide their modest origins with the use of 2D graphics and colorful style. Gunpowder, however, sticks with realistic, unstylish 3D graphics. As a result, its low-tech, low polygon assets come across looking just plain ugly, like a PC game that was cutting edge back in 2003. The backgrounds are all drab and boring, and the various objects and items in the game are low on detail. The game is locked in an overhead view with no zoom, which renders the 3D portion of the game worthless – which begs the question of why this style was chosen. For the most part, Gunpowder is an unattractive game that would have benefitted from a different graphical approach. You may not know it going into the game, but Gunpowder is also available on iOS. If you didn’t know this, then you would figure it out rather quickly, because it has all of the familiar trappings of mobile puzzle games. They become jarringly obvious early on. Each level has a primary goal with three bonus collectible objects, and the level select screen is highly reminiscent of a game like Angry Birds. The puzzles are divided up into worlds, with each world featuring a new theme or gameplay element. In between worlds is a quick, silent cut scene that attempts to tell a razor thin story while setting up the next set of levels. In addition, the tooltips all still show finger taps and swipes instead of mouse clicks. It is not a huge detriment to the game, but when you combine it with the unimpressive graphics, it lends the game a cheap feel. Despite its flaws, Gunpowder hits the most important notes for a simple puzzle game. It is a fairly easy game to recommend, although at $10, the PC version is hard to recommend over the iOS version, which is only $3. The PC version doesn’t benefit from better controls or great graphics, so there isn’t a lot of reason to buy it if you have a mobile alternative. If not, then it is still a good little time waster and, at times, even more than that. It is not likely to be the next big thing though, and it wears out its welcome if you play it longer than in half hour spurts. 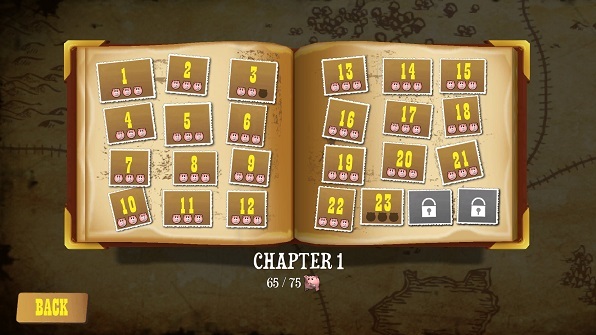 Wherever you play Gunpowder though, you should find enough puzzle solving highs to make it a worthy purchase. When the game is at its best, it provides exactly what a video game about a submarine should provide -- that childlike sense of wonder and adventure that can only come from a new discovery or a narrow escape from a tough battle. It is just a shame that the game is hampered by some major flaws that shouldn't have been terribly difficult to avoid. Its gameplay is still rock solid, the level design is impressive, and the highs that you get from solving a puzzle are still there. It's still a game that succeeds at a basic level. It just doesn’t provide the unforgettable, lasting, and profound experience that made The Talos Principle such an unforgettable experience.